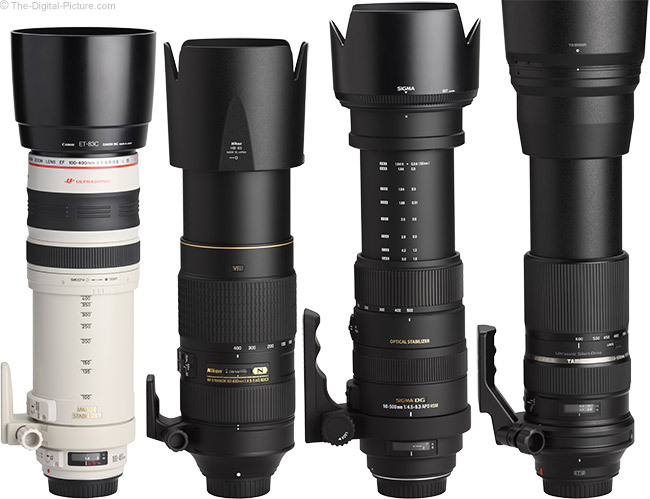 From a focal length range perspective, the Sigma 50-500mm f/4.5-6.3 DG OS HSM Lens is without comparison. 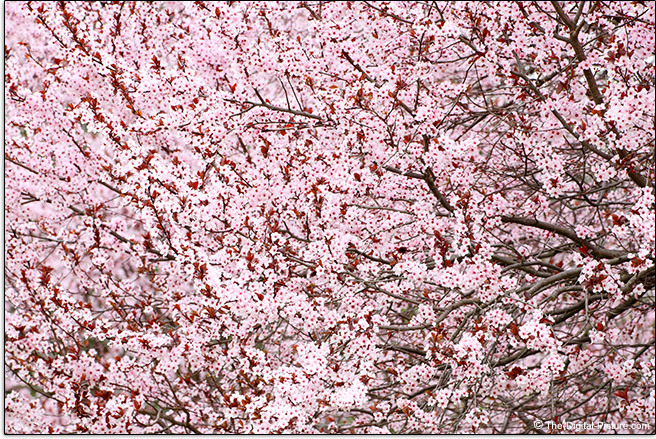 Featuring a 10x focal length range (500mm/50mm = 10x) that starts with 50mm, this lens can cover a huge range of needs. The 500mm designation at the upper end of the focal length range is especially attention getting. As usual, I'm going to start this lens review with a look at the focal length range the lens provides, and, as hinted, the focal length range is this lens' greatest asset. The 50-500mm range, mounted on a full frame body, takes us from a "normal" focal length into a very long telephoto focal length. Mounted on an ASP-C/1.6x FOVCF sensor format DSLR, this lens delivers an even more incredible 80-800mm full frame angle of view equivalent. To see what the 50-500mm focal length range looks like, I take you to the local kid's park where a game no one had envisioned when I was a kid has been installed. Go back and forth between the 50mm and 500mm examples to get a feeling for the extremeness of this focal length range. The 9 oval game options in the center of the 50mm example become tightly framed in the 500mm example. While Sigma refers to the 50-500 OS as an “all-in-one” lens, most photographers are going to minimally want a general purpose zoom lens in their kit in addition to this one. Still, the list of uses for 50-500mm are beyond my imagination. 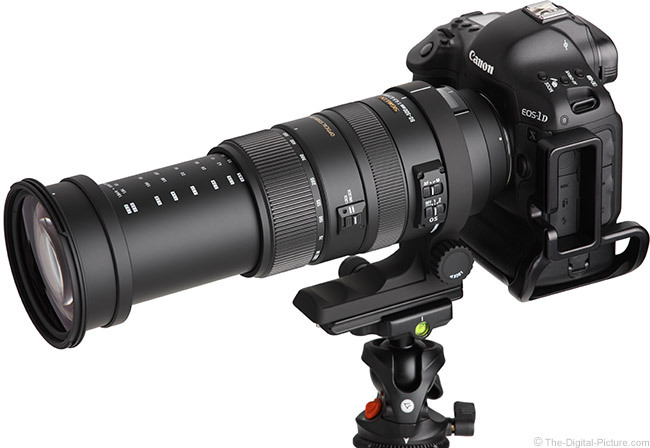 People, places, things, wildlife and landscape photography are very good uses for this lens. An air show is a great place to have this lens in your hands. While this focal length range is awesome for sports photography, the narrow max aperture (discussed below) is going to be a disadvantage for this use. This lens is best-suited for bright daylight games and meets. Moderate cloud cover will have you reaching for high ISO settings to allow motion-stopping shutter speeds. While it is easy to sit in one location and create a wide variety of subject framing from this lens, don't let the huge focal length range make you lazy. Use perspective for composition when possible. Just because you can zoom in to tightly frame a subject doesn't mean that where you are currently standing gives you the best perspective for the image. If you cannot physically move closer or if your subject presents a danger to you (a lion or race car for example), shoot from as far away as possible. But, if you are able to move closer and the less-compressed closer point of view results in a better perspective for your subject and its surroundings, move closer. This lens affords you a huge range of perspectives. That said, the strong background blur creatable by using a long focal length, especially with a close subject, is very attractive. The 50-500 has the longest focal length range, but it comes in dead last in the max aperture comparison. This lens is among the "slowest" (narrowest aperture) lenses available and barely gets to claim f/4.5 in the product name. The 50-500 OS Lens' predecessor, the pre-OS Sigma 50-500mm f/4-6.3 EX DG HSM Lens AKA "Bigma", shares the range but has a 1/3-stop faster "f/4" in its spec and holds that 1/3 stop advantage over much of its lower and upper ranges. 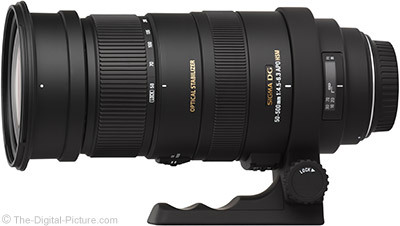 Sigma obviously found benefit of some kind (size, weight, cost, performance) to making this lens even slower. However, the max aperture difference between the all of above-compared lenses (where there is one) is most often 1/3 of a stop (with some 2/3 stop differences in the Canon and Nikon comparisons). A 1/3 stop difference is not going to be a decision maker for most. 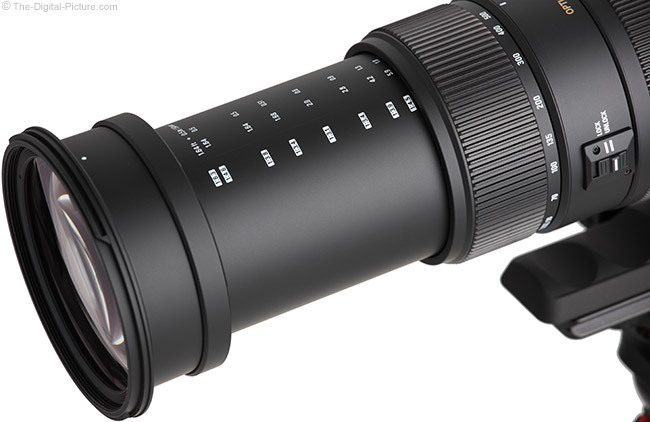 The Sigma 50-500mm f/4.5-6.3 DG OS HSM Lens has a 4-stop rated optical stabilization system. Such is especially appreciated when using a narrow aperture lens at a long focal length. OS aids greatly in image sharpness during handheld photo capture and also aids greatly in handheld subject framing prior to the capture. When this OS system starts up and shuts down, you will hear a light click and the image in the viewfinder may jump modestly. While running, this is one of the quietest image stabilizers I've used. Subject framing moves around somewhat at times while OS is active. I am getting about 3 stops of benefit from OS at 50mm (hand-holdable at 1/6 second) with a low percentage of shots being sharp with exposures as long as .5 seconds. At 500mm, with good form, solid footing and no wind, I am getting good results at 1/30 second with a reasonable percentage of images being sharp at 1/15 seconds. The benefit at 500mm is 4 stops or more. This is comparatively excellent performance. Sigma recommends turning off OS when using a tripod and before un-mounting the lens. When reviewing a lens, I usually have some preconceptions. I never let those preconceptions influence my testing, but when you've done this as long as I have, preconceptions are simply unavoidable. When reviewing a lens with an extreme zoom focal length range, my first preconception is usually that image quality, especially sharpness, will be compromised. With the image quality test results captured and loaded into the site's tool, and the opening 50mm results showing, I was impressed. This lens has very nice sharpness across the full image circle at wide open apertures – until 300mm. The 300mm results show a significant turn for the worse and 400mm wide open aperture results are noticeably worse than the 300mm results. The 500mm wide open aperture results are more similar to the 300mm results than the 400mm results, but ... that is still not good. My immediate thought was that the results were concluding my preconceptions. This lens was good up to somewhere in the 200-something mm range. I next looked at stopped down aperture results. I didn't hold much hope because this lens is only f/6.3 from 244mm and longer. There is not much room to stop down from there. The good news is that this lens surpassed my initial expectations and shows very substantial improvement at f/8 over f/6.3 in the 300-500mm range. That link will show you the major improvement at 400mm (use the mouseover feature). The results are not quite as good as at 200mm, but at f/8, the 300-500mm range has decent sharpness. Stopped down improvements in the 50-200mm range are going to be much harder to see. There are some slight improvements, but the improvements lie primarily in the peripheral image circle. Full frame DSLR owners will see between 2 and 2.5 stops of peripheral shading from this lens with a wide open aperture. This amount is noticeable, but not strong (relatively speaking). At f/8, vignetting ranges from about .6 stops at 50mm (not typically noticeable) to about 1.4 stops at 500mm. The variation is to be expected because at 50mm, f/8 is 1 2/3 stops narrower than wide open and at 500mm, f/8 is only 2/3 stop narrower. Still, about 1.2 stops of corner shading remains at f/11. As is often the case, APS-C format DSLR owners need not worry about vignetting from this full frame lens. CA (Chromatic Aberration) is a lens defect that has not eluded this superzoom. Starting at 50mm, CA is quite noticeable in even the outer APS-C image circle. CA slowly improves/reduces with focal length increase until CA becomes hard to notice from about 135mm through 300mm. CA then quickly worsens until it is very easy to see the non-identically-focused light wavelengths on a black and white test target at 500mm as shown below. Uncorrected, CA will have an impact on peripheral image circle image sharpness. When reviewing a lens with an extreme focal length range, my expectation is that distortion will be strong. While this lens is not distortion-free, there is considerably less distortion than I expected to see. At 50mm, a mild amount of gently curving barrel distortion is present. By 70mm, the cross-over to mild pincushion distortion has already occurred. Distortion increases slightly until 135mm and the mild pincushion distortion persists similarly through the balance of the focal length range. This lens will readily show flare with a bright light in the frame. Bokeh (quality of the background blur) seems good. The 9-blade aperture creates nicely-rounded out of focus highlights with nicely smooth centers. Another asset of this superzoom is the AF system. 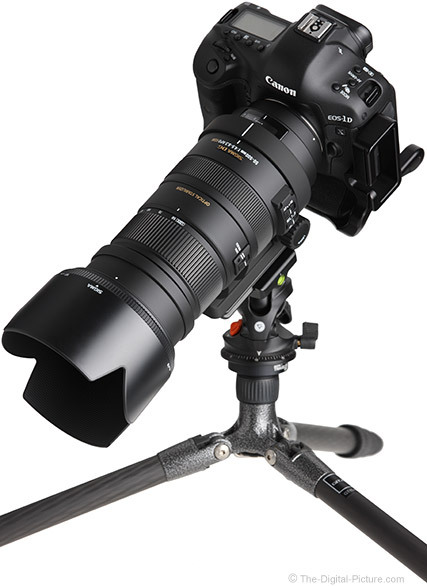 The Sigma 50-500mm f/4.5-6.3 DG OS HSM Lens, featuring Sigma's HSM (Hypersonic Motor) driven AF, autofocuses very fast with very little sound. This is an internal-focusing lens that supports FTM (Full Time Manual) focusing. No focus range limiter switch is provided. As with most quality lenses, filters do not rotate with focusing. A narrow aperture lens, with its relatively deep depth of field, does not challenge AF accuracy as much as a wide aperture lens in the same focal length does, but I am finding this lens to focus accurately with reasonable consistency. These findings apply to both One Shot mode and to the always more challenging AI Servo mode. With a 5D Mark III behind it, I captured hundreds of shots of athletes in action with the majority of those images being properly focused. Focus distances (in both ft and m) are provided in a window, but they will primarily be useful only as a guide due to the focus adjustments required throughout the zoom range. This is not a parfocal lens – plan on focusing after selecting your focal length. Videographers especially will appreciate the lack of focus breathing in this lens. Subjects remain very similarly sized as they go into and out of focus. The manual focusing ring is adequately sized and very smooth with no play. The MF ring's rotational resistance is very nice (Sigma usually gets this right). With 133° of rotation for a full extent change, manual focusing is nice at 50mm, but touchy at 500mm. A 50% advantage over the competition is always nice and that is the 50-500's maximum reproduction ratio advantage over the other similar lenses available at review time. Lenses usually have the same minimum focus distance spec applied across their entire focal length range, but not always. The Sigma 50-500 OS is a lens that breaks this norm. Since finding the focal length that provides the MM (Maximum Magnification) this lens is capable of is slightly complicated, Sigma shows us the minimum focus distance and the resulting maximum reproduction ratio right on the lens barrel as shown below. If you want to capture a subject as enlarged as possible, zoom to 200mm where the 1:3.1 MM label rests against the end of the zoom ring (0.32). If you are not feeling so perfectionistic, simply turn the zoom ring somewhere between 135mm and 300mm for a MM not worse than 1:3.4 (0.29x). Here is a close-focusing spec comparison table. There are not many non-macro lenses that have a MM as high as this lens does. This is a great advantage for many subjects including flowers and products. As usual, MFD can be decreased using extension tubes and reducing MFD increases MM. 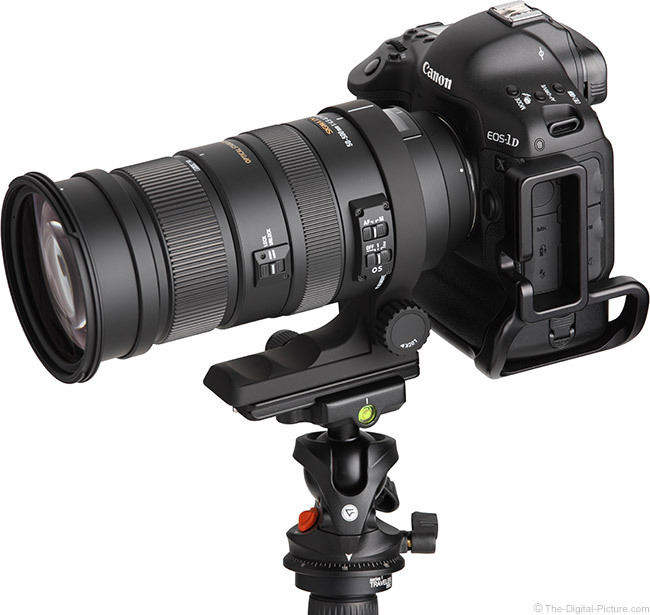 Tele-converters significantly increase MM at mid-long focal lengths and the Sigma 50-500mm f/4.5-6.3 DG OS HSM Lens is compatible with Sigma's 1.4x and 2x DG tele-converters. With the 1.4x mounted, this lens becomes a 70-700mm f/6.3-9.0 OS lens and a 100-1000mm f/9.0-13.0 OS lens when the 2x is behind it. While those are very impressive focal length numbers, don't get too excited as those numbers are about the only attractive aspect of mounting tele-converters behind this lens. The image quality results from these combinations at the longest focal lengths (the focal lengths you need tele-converters to get to) are simply ugly. Even stopped down to f/16. The CA is so bad that I feel the need to reach for the 3D glasses (see the results out using the site's image quality tool). Only Canon 1-series bodies and the 5D Mark III can focus the 1.4x combination and no DSLRs will AF with the 2.0x mounted. So, while this lens may be compatible with teleconverters, I highly recommend not using them. Sigma's 50-500 OS lens is very nicely constructed. The matte black finish is smooth and the rubber focus and zoom rings are slightly-differently-ribbed for easier identification. This finish is a significant upgrade to the easily marked and frequently peeling finish found on the Bigma. This lens extends significantly (3.44"/87.3mm) when zoomed to 500mm, but you will not find the point of ideal balance changing too much with focal length selection. 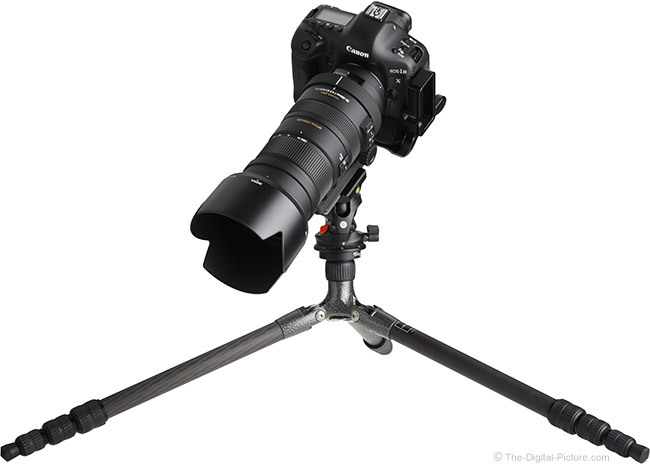 Extended to 500mm, the ideal balance point is somewhere around the focus ring. Holding a lens under the focusing ring is not usually a good idea as it is too easy to inadvertently adjust focusing after AF has completed. Retracted, the ideal balance point is slightly rear of the focus ring, right where the AF/MF and OS switch bank is significantly raised and slightly uncomfortable. The best option is to hold the lens just forward of the focus ring and deal with the slight imbalance. The raised zoom lock switch adds a bit of discomfort in this grip position. The AF/MF and OS switches are easy to reach and though I have not experienced any problems, I would prefer a bit more resistance in the OS switch to prevent accidental changes. The zoom lock switch is easy to reach and you will probably find this switch very useful as this lens gravity-extends rather easily due to the weight of the lens elements in the extending portion of the lens. 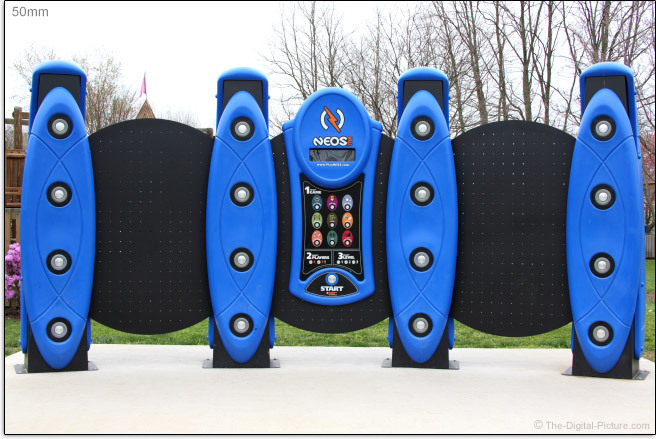 Overall, 50-500 OS is solidly built with no play in the moving parts. This is not a weather-sealed lens. The Bigma was big and the 50-500 OS is even bigger. The Bigma II is also heavier. You are going to know that you have had this lens in your hand if carrying for any significant length of time. It is, however, quite hand-holdable for moderate periods of time. For many more comparisons, review the complete Sigma 50-500mm f/4.5-6.3 DG OS HSM Lens Specifications using the site's Lens Spec tool. 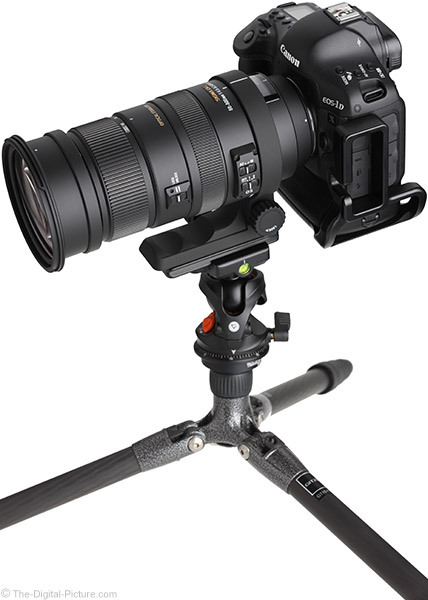 More comfortable is using this lens on a tripod or monopod. Being a large and heavy lens, the Sigma 50-500 OS comes with the tripod ring needed to properly balance it on these supports. This ring is strong and very smooth functioning. The foot provides plenty of clearance for fingers. By fully loosening the lock knob and rotating to the designated "remove" mark, this tripod ring can then be removed by pulling backward (a camera cannot be mounted while removing the ring). The foot includes finger groves on the upper side, facilitating its use as a carrying handle. Appreciated is that Sigma includes a lens hood with most of their lenses. Lens hoods are useful for both lens protection and from flare protection (which this lens especially appreciates). This is a wide hood, but it is not overly long for a lens with a 500mm focal length. The reason is of course that it must also support the 50mm focal length. Not shown in the images on this page is the APS-C hood extension that is also included. The extension better-shades the narrower angle of view utilized by the APS-C sensors. The 50-500 OS uses very large and expensive 95mm-sized filters, but those using an APS-C format DSLR and not needing the full image circle provided by this lens can use the 95mm to 86mm step-down ring that Sigma provides in the box. While the step-down ring is a nice inclusion, an 86mm filter size is still very large and not common (though it is the same size that the 50-500 non-OS Bigma uses). 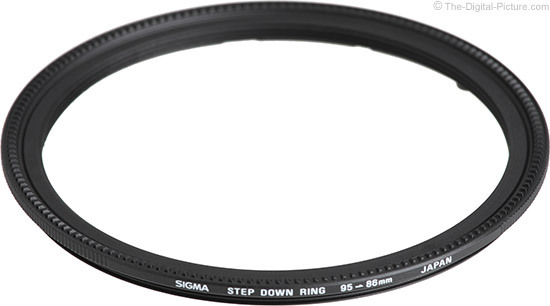 Sigma goes on to significantly reduce the value of this adapter by stating "*It is not possible to use a Polarizing filter with the step down ring. If you attach a Polarizing filter, you may not be able to remove it from the lens again." So, the most popular and useful effects filter available cannot be used on this adapter. An 86mm lens cap must also be purchased when using the step-down adapter. This is a large and heavy lens, so you may be more comfortable having its weight being supported directly by the included lens neck strap (shown below) instead of hanging from your lens mount under your camera's neck strap. Also included in the box is a lens case. 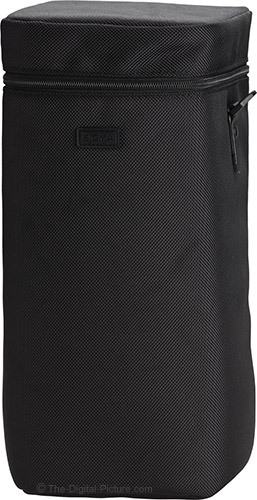 The case is the standard (nice) Sigma black nylon padded, zipper case. This case is quite large due to provision for the non-reversing APS-C lens hood extension. A large cushion on the bottom of the case fills the void and affords proper lens protection when the APS-C extension is not attached. There is no belt loop on this case, but it would be very large to hang from a belt. A neck strap is a better option and one is included for the case (shown below). To get the huge focal length range, "All-in-one" [Sigma] lens requires a premium price to be paid. This lens is priced up with some of the best Canon and Nikon models. Of course, you may not need to buy as many lenses and when viewed from this perspective; this lens is a reasonable value. Obviously, the top of the Tamron lens hood was cut off in this image. When extended, this lens reaches out of the frame in my standardized lens photo setup. The Sigma and Canon are very close in price when no rebates are in play (the Sigma has a slight advantage). From an image quality perspective, these two lenses are very similar through 200mm with the Sigma perhaps having a slight advantage. From 200mm through 400mm, the Canon is the clear winner – even stopped down. The Sigma has modestly less distortion at 100mm, but more throughout most of the balance of the zoom range. The Nikon compares similarly to the Sigma as the Canon from an image quality perspective. The Nikon, however, is far more expensive. The Tamron is the lens I most recently reviewed. Until 300mm, the Sigma and Tamron compare similarly in image sharpness. From 300mm through 500mm, the Tamron has a clear advantage. I prefer the Sigma AF system and the accuracy it delivered better than the Tamron's. The Tamron is considerably less expensive. 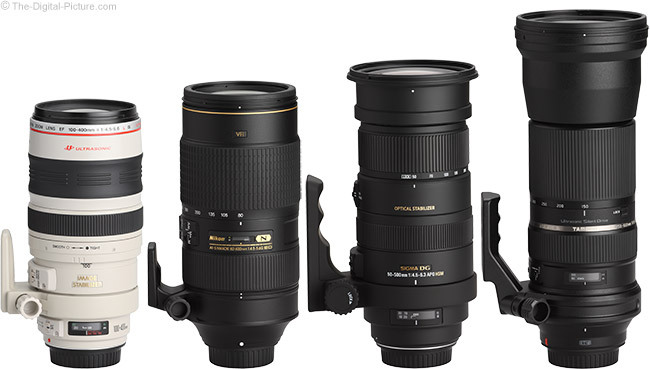 As noted throughout the review, the Sigma has the longest range of focal lengths, but the Tamron takes the long end 100mm farther than the Sigma. That last 100mm of range is the Tamron's weakest, but again, the Tamron is considerably sharper than the Sigma from 300-500mm. The Sigma 50-500mm f/4.5-6.3 DG OS HSM Lens is available in Canon (reviewed), Nikon, Sony/Minolta, Pentax and Sigma mounts. My standard disclaimer: There are potential issues with third party lenses. Since Sigma reverse engineers (vs. licenses) manufacturer AF algorithms, there is always the possibility that a DSLR body might not support a (likely older) third party lens. Sometimes a lens can be made compatible by the manufacturer, sometimes not. There is also the risk of a problem that results in the lens and body manufacturers directing blame at each other. Sigma USA's 4-year warranty is superior to Canon's standard 1 year warranty (Sigma's international warranty is also 1 year). My evaluation Sigma 50-500mm f/4.5-6.3 DG OS HSM Lens came from an online retailer. Any 10x DSLR zoom lens is going to be attractive, but one that ends with a 500mm focal length is going to get an especially large amount of attention. As of review time, no other option will take you from 50mm to 500mm without a lens change. When a situation presents itself, you may not have time to change lenses and that is when a superzoom can make all the difference in your take-home.